There’s little doubt that similar charges would have been filed against Alfred Hitchcock’s 1954 film Dial M For Murder had it been widely seen, as he shot it, in 3-D. Just as the default assumption is that 70mm is best used for widescreen spectacle—the sweeping dunes of Lawrence Of Arabia, or the endless reaches of 2001: A Space Odyssey—so 3-D has almost invariably been exploited for isolated shock effects: a spaceship that goes whizzing overhead, or an axe thrust out of the frame. Partisans of the new 3-D—principally DreamWorks’ Jeffrey Katzenberg, who has openly touted the ability to charge higher prices for 3-D screenings as the salvation of the theatrical-exhibition business—like to tout the “immersive” qualities of more recent processes, but the vast majority of modern 3-D movies make little use of their added dimension. Often, the upshot of the surcharge is that viewers pay extra to wear ill-fitting glasses and watch a movie that’s never as bright or sharp as it ought to be. Like directors during the pre-letterbox era, who were forced to simultaneously frame their shots for theatrical widescreen and square-ish TV sets, modern-day directors have to take into account that most people will end up seeing their movies in the 2-D comfort of their living rooms. Genndy Tartakovsky, the director of the 3-D animated feature Hotel Transylvania, told The A.V. Club that he altered some shots for the 2-D version, removing foreground elements that were too distracting without the illusion of depth, but live-action filmmakers don’t have that option, and few seem to care. What a movie like the recent Dredd gains in depth of field, it more than loses in illumination and clarity. It’s like swimming through murky waters, knowing that something’s off in the distance but being unable to tell what it is. Although 3-D, as Katzenberg would be the first to point out, was cruder in Hitchcock’s day, the reason for its existence was no different. Then as now, the movie industry needed to find a way to lure audiences out of their homes and back into theaters, wooing them away from their newfangled TV sets with a plethora of new formats, including 3-D, Cinerama, and 70mm. Only now, theaters’ competition isn’t a fuzzy black-and-white image, but a picture that rivals, and—given the absentee management of many multiplexes—sometimes surpasses the quality of seeing a movie in a theater. (A properly projected 35mm print, or even a 4K digital projection, still crushes the quality of a flatscreen TV, but the operative word is “properly.”) The showier the spectacle, the more easily the distinction is drawn between home and away. In other words, the determination of which movies these formats are best used for has less to do with art than commerce—it isn’t, “Would this film benefit from 3-D?,” but, “Can we sell more expensive tickets?” By that standard, Dial M For Murder is hopelessly, almost hilariously, misguided. Even had the short-lived 3-D fad not died out between the time Hitchcock shot the movie and its release (the film was delayed due to a contractual agreement that it wouldn’t open until the hit play finished its run), it’s hard to imagine viewers turning out in droves to see a 3-D movie that was shot almost entirely in a single room. Even when they wanted 3-D, which wasn’t for long, they wanted House Of Wax or It Came From Outer Space, not a theatrical production that at first glance appeared to have been altered only slightly en route to the screen. In a brief documentary included on Warner Bros.’ new Blu-ray, which for the first time makes the 3-D version of the film available to those with compatible sets—a digital transfer is also touring repertory cinemas—Peter Bogdanovich recalls Hitchcock telling him that his default move when he wasn’t sure what movie to make next was to “shoot a hit play,” and that having bought the rights to the play, Hitchcock’s instinct was to alter it as little as possible. “You’re buying the construction,” Hitchcock said. The word “construction” is especially apt, with its connotations not only of structure, but the organization of space. In a characteristically detailed breakdown of Dial M, film historian David Bordwell, who introduced a screening of the restored version (now converted from the original two-strip process into Dolby Digital 3-D) at Toronto, quotes Hitchcock from his series of interviews with François Truffaut to the effect that the common practice of “opening up” a stage play for the screen “overlooks the fact that the basic quality of any play is precisely its confinement within the proscenium.” Part of what makes a good play work is the way it uses the immutable space of a theater stage, and directors attempting to realize a play in another medium ignore that aspect at their peril. 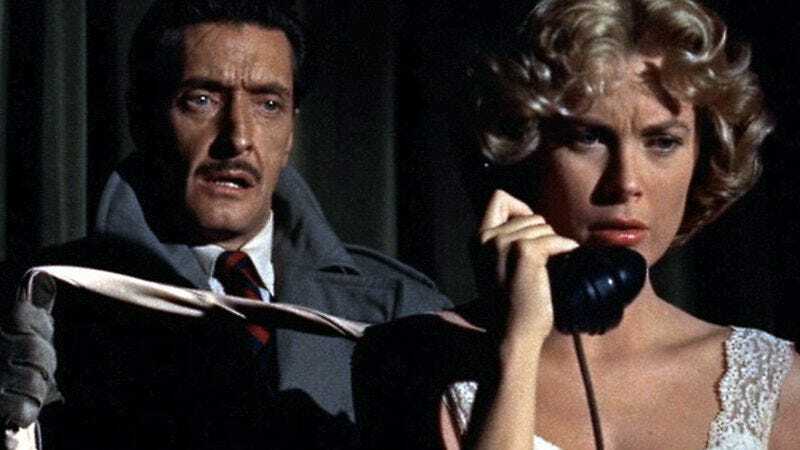 Dial M For Murder is hardly a great play, and unlike Sorry, Wrong Number, which was filmed a few years earlier, there’s no compelling reason why the action has to be confined to a single room. At least, not until the cuckolded husband (Ray Milland) attempts to stage the murder of his two-timing wife (Grace Kelly), which ends with the wrong person dead, and the couple’s apartment becomes the scene of a crime. But as with Rear Window, Rope, or Lifeboat, Hitchcock clearly saw in the play’s single-set confinement an opportunity to experiment with new ways of using the camera to explore space, and the opportunity to shoot in three dimensions gave him a whole new set of tools. Dial M isn’t exempt from 3-D’s hokier excesses, especially distracting foreground elements of the kind Tartakovsky removed from the flat Hotel Transylvania. Stray end tables eclipse the movie’s ostensible stars, trapping them behind a low wall of living-room furniture. But Hitchcock purposefully alters the depth of field, increasing the sense of confinement as Milland hatches his plan, and then turns the tables once he lurches into motion. Most famously, Kelly’s hand shoots out past the end of the frame as she struggles for life, reaching out into the audience for help. But Hitchcock also uses 3-D in a series of striking overhead shots in which viewers seem to be staring through the screen into the set, like children peering into a terrarium. Rather than reaching out to swaddle the audience in a virtual environment, Hitchcock draws them into, even through, the screen. The feeling is startling in its difference: less naturalistic, perhaps, but also more tangible. By contemporary standards—Hitchcock’s as well as ours—he’s using 3-D the wrong way, deploying a costly, cumbersome technology for what amounts to a chamber piece. But limiting the territory the film covers actually allows him to explore it in depth (pun unintended, but apropos). Even if shooting 3-D forced Michael Bay to relax the normally epileptic pace of his editing, Transformers: Dark Of Moon never keeps still long enough for the artificial distance to be more than a vague blur. There are a tiny handful of modern movies that use 3-D effectively, often those that linger in or return to a fixed set of environments: Henry Selick’s Coraline, Chris Butler’s ParaNorman, Ridley Scott’s Prometheus, James Cameron’s Avatar, even a few sequences in Resident Evil: Retribution. But few directors seem to have devoted as much contemplation to how 3-D works best as Alfred Hitchcock did nearly six decades ago. The technology has improved vastly, but the thought behind it has not.